Yesterday was Thanksgiving day. It is my favorite holiday more than Christmas or Easter. I should not say that since I am Catholic. But that’s the point of Thanksgiving, it transcends one’s religion or belief. I have many things to be thankful for, especially after I was diagnose with cancer in March 2008. This year was bad for me, and I have come a long way from having a bad prognosis January of this year. I didn’t think I would make it to celebrate thanksgiving. But I am here. The turkey was good…burp! My sister and her family arrive from Toronto and I was once again surrounding by family. This year I even have my mother with me, which is always special. I went back to Thanksgiving 2012 (see The Bald Truth posting) to remind me of what I went through. Last year, I was bald and my wife cut her hair short to become bald as well. Thanksgiving 2011 (see Happy Thanksgiving – Round 2 was the beginning of my new treatment and it was toxic for me. It was then that my cancer went to my lungs from my liver: another relapse. Thanksgiving 2010 (see My Thanksgiving posting) was a fulfilling year for running but I also had a liver resection that year. Thanksgiving 2009 (see Happy Thanksgiving posting) was when I found out when my cancer came back after a year. That was a hard news to take. Lastly, Thanksgiving 2008 (see November 2008 posting here) was my first Thanksgiving with cancer. Back then I did not know what lies ahead but I am still thankful. Now, I still don’t know what lies ahead nor anybody else. What is important is my time (or our time) is here and now. Happy thanksgiving. They say everything in Texas is big. That’s an understatement. MD Anderson is huge and is located in downtown Houston in a campus along with other hospitals, like Texas Children’s Hospital, Baylor Clinic, and St. Luke’s Womens. MD Anderson itself has several buildings within the campus. The only thing I can compare it to is Mayo Clinic in Rochester, MN, which is also big. But one thing is common among all the hospitals I have been to, are the patients. Big or small hospitals, patients need help. As I sit there in awe of my surrounding, I still have the same anxiety of not knowing what is going to happen. At MD Anderson, they specialize in cancer research and I see many patients of different ages and in different stages of their cancer. It is normal to see some patients walking around as they drag their chemo infusion pumps along with them. I have never seen so many cancer patients in one hospital. It is a different world when you enter MD Anderson; different from Mayo, Northwestern or Swedish. What I like about MD Anderson is their staff. I think they fully understand the needs of cancer patients; how precarious their life is. They get it. And they are consistent in really helping you out; from the moment I called for an unscheduled appointment up to the way they welcomed me at the hospital. They know how to take care of cancer patients. My doctor is Dr. G, a Mayo-trained medical oncologist and educated in Dublin, Ireland. He is a pleasant man and methodical in asking about my medical history. He is also very generous with his time and would diligently try to understand my needs. At the end of almost two-hour consult, he gave me all the options available to me. There was surgery and experimental trials, which gave me hope. Hope is a precious commodity when fighting cancer because there is no cure for it. I am not short of hope or prayers, I just wish the cure comes in time for me to benefit from all the research. As my wife would say, it will come but in God’s time. Just a quick note. Received call from MD Anderson yesterday, Nov. 15, that they will be able to see me Monday. Yes! Thanks you! The results of my scan. With that I showed it to my wife and mom, and we all hugged. My mom was more emotional. I can feel her mother’s love: she has witnessed, from near and far, all my ups and downs over the years. It is from her I draw strength when I feel weak. At her age, she does not have to take care of me or witness my struggles, and yet she is there. My oncologist and I spoke on his next plan for me. He and I know, he is running out of options. For almost six years, he has given me all the chemo drugs available for my type of cancer. Some put me almost to the edge of death, while others gave me allergies and complications. They have infused me with it and I have taken it in pill form. He also knows, I would like to seek another opinion at MD Anderson in Houston, TX. I initially wanted Memorial Sloan Kettering in NYC, where they are using IBM’s Watson for cancer research, but they were not responsive. Initial feedback from MD Anderson was I go on clinical trials because I have practically received all the applicable chemo drugs, and in large quantities. However, they cannot see me until I finish my current treatment and see the results of my scan. Weill it is out. It showed persistent, possibly improving bilateral pulmonary metastatic nodules. In english: it is still there, did not grow but improved, and still present in both lungs. It takes a lot of energy for me to earn a day. I am not like others who’s tomorrow is almost guaranteed. It is a given for them to finish the race in quality time, while I struggle to run mile after mile. And when I do reach the finish line, I find out they moved it again. This time they moved it to Houston. P.S. October 18, IBM Watson is now in MD Anderson to be used for leukemia studies. I wish they had started with colon cancer. Oh well. should not eat chocolate. It contains sugar and feeds my cancer. It also contains enzymes to make you feel good, so that is my excuse. I have been sluggish and unmotivated lately. It bothers me how I am not able to recover faster or maintain my energy levels during treatments. My hands are darkened, dry, and cracked that I wear gloves to hide and protect it I have skipped going to the gym early mornings and if it was not for my work that keeps me busy, I would have slid fast to depression. I am tired of all the side-effects. My previous post says it all: What for? But somehow, I found a way to claw myself out of the big hole I dug myself into. Numb with tiredness, I managed to go back to the gym at 5am one morning. It even surprised my wife when I asked her in the middle of the night to go with me to the gym. She knew I was struggling and could only watch and pray from a safe distance. I have been impatient, moody, short tempered, and stressed with work. I don’t like myself when I am in a hole. I feel useless and at the mercy of cancer. For the religious, prayer is the answer. For the strong, it is the will to fight. For those with shaken belief, acceptance of what is given. You can cut as many perspectives or rationalization as you want, at the end of it; is me. I will have to get myself out of the hole or die. Which brings me to the hot chocolate and its soothing or aphrodisiac qualities. 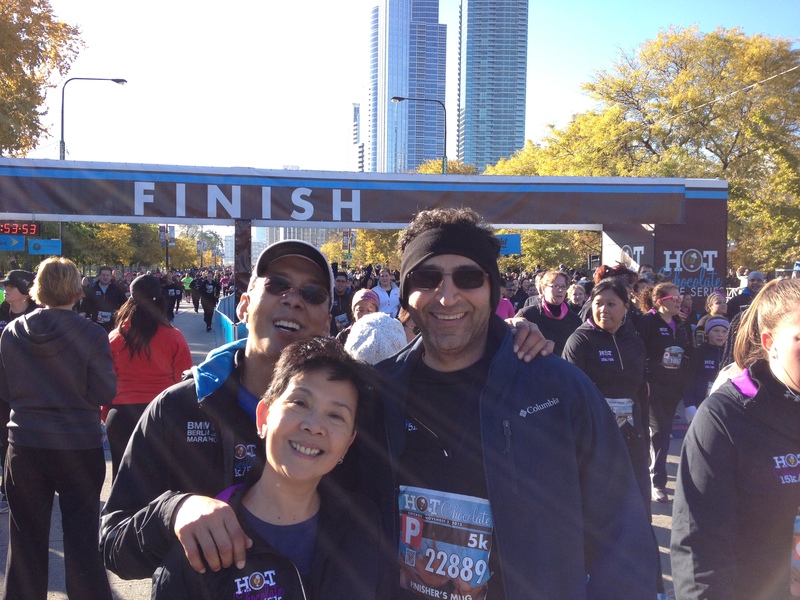 Over the weekend, my oncologist (Dr. M), my wife, and I ran the Hot Chocolate 15k/5k race. Dubbed the sweetest race in America, it was enough to get me out of my self-imposed hole. It is my first and only race for 2013, and it came at a time when I needed the boost. 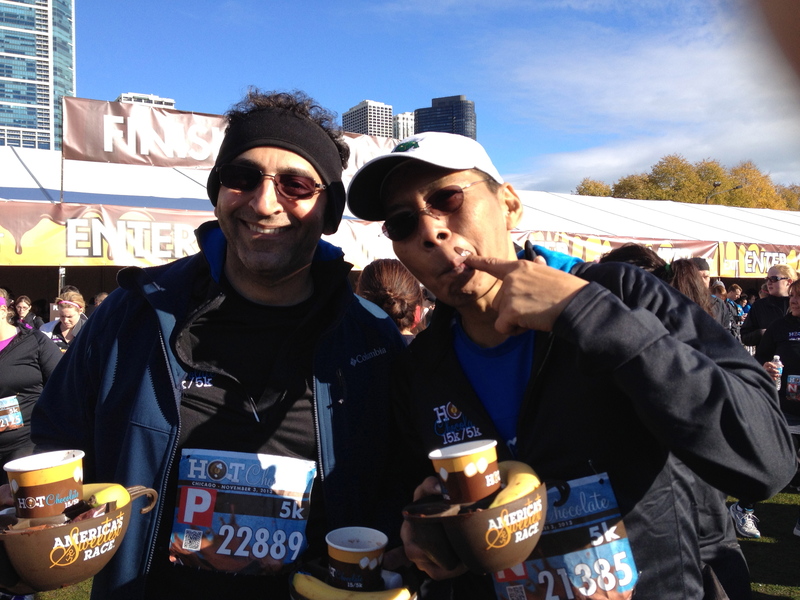 Also, it was the first time for my oncologist to run a race so it was joy seeing him transform to a runner. I am not useless after all. We share a common passion now. He takes care of me, I take care of him. He enjoyed the experience of going to the expo to get our bibs, run with 20,000 other runners , and at the end of the race: chocolate. We just ran the 5k race so he can make it to his rounds after and the short race ensured we have chocolates at the end. Ha! I had a great time. I am back.